The Little Mermaid : Ariel's Royal Wedding. 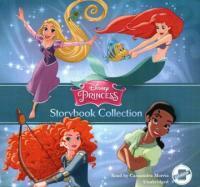 Join Rapunzel, Ariel, Tiana, and the rest of the Disney princesses for the fourth edition of this top-selling storybook collection, featuring 14 completely updated stories. Description: 2 audio discs (2.5 hr.) : CD audio, digital ; 4 3/4 in.